Using Foreign Exchange (FX/Forex) Trading Services not only diversifies your portfolio risk, but also maintains the liquidity of your capital based on your own needs. 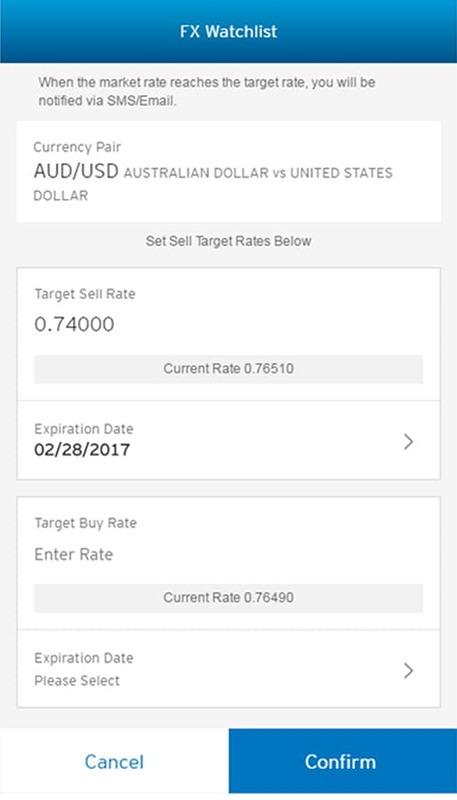 Moreover, it enables you to capture any upside opportunities by way of FX trading with currencies that include AUD, CAD, CHF, EUR, GBP, HKD, JPY, NZD, RMB, SGD, USD. Be aware that FX trading is subject to rate fluctuations, which may present both opportunities and risks, including the possible loss of the principal amount invested. Open an account with us from now until June 30, 2019, and you can enjoy the Bank’s Cost Price for every successful FX transaction via Citi Mobile® App within the first 3 calendar months from account opening* - Genuine 0% Spread with no profit margins for the Bank! 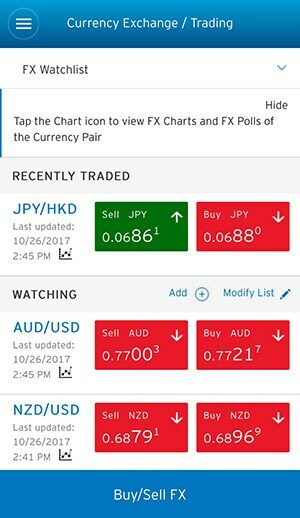 *The exchange rate/pricing indicated in the Citi Mobile® App for any particular currency pair generally includes all-inclusive profit margin/ spread of Citibank (Hong Kong) Limited (The “Bank”) for the Eligible Transactions. The spread will be charged upfront and subsequently rebated to customer's debit account within 3 months after the Eligible Offer Period. 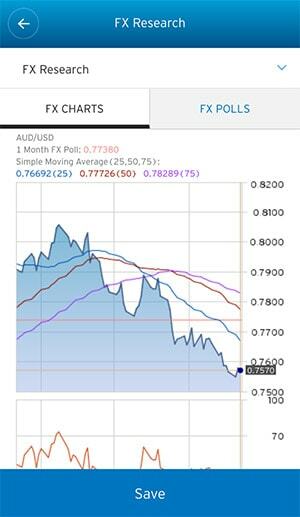 FX trading involves risks and rates may go up or down. Terms and Conditions apply. 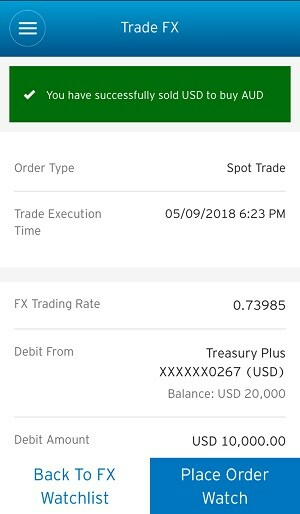 Using online loan drawdown / repayment service under Treasury Plus* for FX spot trade to enhance the investment potential. You can long or short a foreign currency pair to hedge the position against the downside or upside risk. 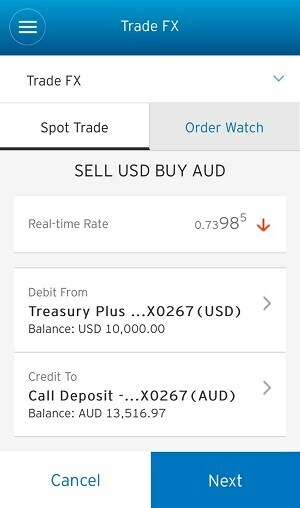 How to draw / repay loan for FX spot order via MOBILE? 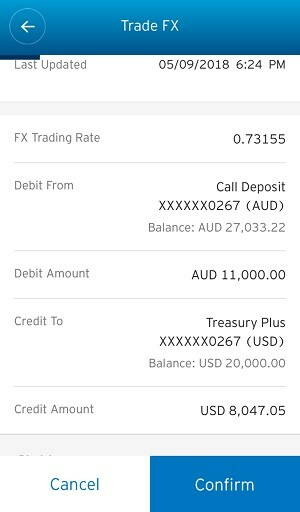 You can draw / repay loan for FX spot order easily with Citi Mobile® App by following the below steps. Step 1: Select Treasury Plus account under "Debit From"
Step 1: Select Treasury Plus account under "Credit To"
Unless otherwise specified, the Promotion Period is valid from April 1, 2019 to June 30, 2019, both dates inclusive (“Promotion Period”). 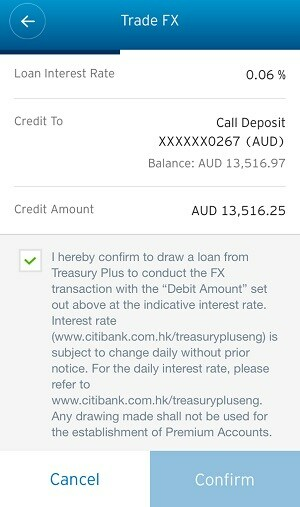 The Promotion is only applicable to clients who do not hold any Citibank (Hong Kong) Limited (the “Bank”) banking account in the past 12 months (the “New-to-bank Clients”). For joint accounts, the Promotion will be applicable to the Primary Account Holder. New-to-bank Clients who open banking account(s) within the Promotion Period are eligible to enjoy 0% Spread for successful Foreign Exchange (“FX”) transactions via Citi Mobile® App under the “Currency Exchange / Trading” function executed (the “Eligible Transaction”) within the first 3 calendar months from account opening (including the month of account opening)(“Eligible Offer Period”). E.g. For a new to Citibank Client who opens an account on April 28, 2019, then April 2019 will be the 1st calendar month. The Client will be eligible to enjoy 0% Spread for the Eligible Transactions until June 30, 2019 (the 3rd calendar month). 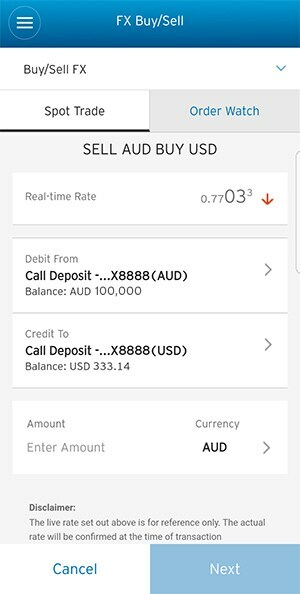 The exchange rate/pricing indicated in the Citi Mobile® App for any particular currency pair generally includes any profit margin/spread of the Bank and the Client will be charged the all-inclusive price for the Eligible Transactions. An amount equivalent to the spread for the Eligible Transaction(s) will be rebated to the Client’s debit account (in that corresponding Sell Currency) within 3 months after the Eligible Offer Period (“Rebate”). If there is more than 1 eligible transaction for the debit account, the lump sum amount will be rebated to the corresponding account. For all currencies except Japanese Yen, the Rebate will be rounded off to 2 decimal places; for Japanese Yen, the Rebate will be rounded off to the nearest integer. If the Client is no longer a client of the Bank or the debit account is closed at the time the Rebate is made, the relevant Rebate shall be forfeited absolutely and shall not be paid to the Client through any other means. The spread applicable to any transaction may differ from time to time, transaction to transaction and/or client to client and also depends on the market situation, the size and/or complexity of the transaction, or other commercial factors. Therefore, a standard amount or fixed rate of the spread prior to any transaction may not be ascertainable for the purposes of these Terms and Conditions. If a client wishes to know more about the spread of any Eligible Transaction, please contact our branch staff. 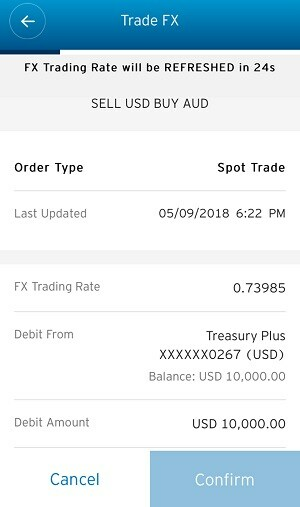 The Promotion cannot be used in conjunction with other prevailing FX Promotion Offers, “US Stock 0% Spread FX Spot transaction” offer and Time Deposit offers involving foreign exchange. 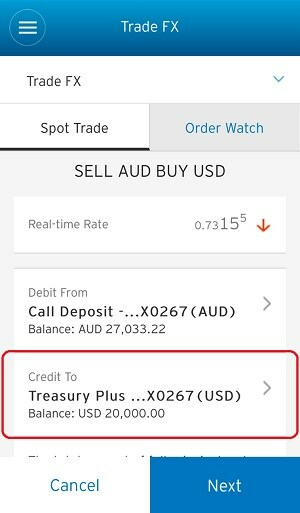 If the transaction(s) is/are also eligible for the “US Stock 0% Spread FX Spot transaction” offer, that corresponding transaction will not be applicable to this Promotion. The Bank reserves the right to suspend, amend and terminate the Promotion, and change these Terms and Conditions from time to time without prior notice. In the event of disputes or any matters in connection with the Promotion, the decision of the Bank shall be final and binding. These terms and conditions shall be governed in accordance with the laws of the Hong Kong SAR and the customers irrevocably submit to the non-exclusive jurisdiction of the competent court of the Hong Kong SAR. The information and data on these pages are provided by third party providers. Such third party content is for general information only, and does not constitute a recommedation or solicitation to purchase or sell any security / position, and does not take into account any views promulgated by Citigroup, Inc. The tenor of the Treasury Plus and the Premium Account are different. The Bank only offers overnight tenor for Treasury Plus. The interest rates for loan may vary daily without notice, customers' interest costs may therefore also vary. This may affect the net return on investments. Customers can inquire latest interest rate by calling the Bank's hotline or website. The loan interest of Treasury Plus will be debited to respective loan accounts on the last calendar day of each month. If the last calendar day is not a bank business day, interest will be debited on the first succeeding business day (includes interest incurred in-between). Customers' loan currencies in Treasury Plus can be different from investment currencies in Premium Account. In such a case for Treasury Plus, customer will be subject to more significant currency risk. Foreign exchange rate fluctuation of the collateral currencies may reduce collateral value and may induce margin call and/or forced sell. Unless after liquidation the outstanding position will not reach any margin call and forced sell level, customer-initiated liquidation of the pledged product will not be permitted if the liquidation proceeds are not for loan repayment. Investment products are not eligible for U.S. persons and might only be applicable to limited jurisdictions. The facility is subject to our annual review whereupon we will re-assess based on our annual review criteria (as determined by us from time to time) which may include, but are not limited to: your (a) credit history, (b) bankruptcy check, (c) net worth and (d) customer segment (Citigold or Citigold Private Client). You may be required to provide additional information or documentary proof upon request. We may renew the Facility (with the same of different Facility Limit and on the same or different terms) or terminate the Facility. The bank reserves the rights to liquidate any or all of the eligible deposit or collateral held with the bank and/or set off any credit balance in any of your accounts (or your joint accounts with other person(s)) against any outstanding balances and terminate Treasury Plus services. The use of leverage means that relatively small price movements will have a multiplying effect on customers' corresponding gains or losses and the degree of investment risk customers face is greatly increased. 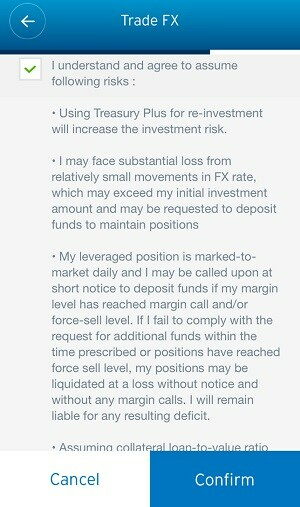 Thus, the risk of loss in leveraged investments via Treasury Plus can be substantial. Customers may sustain losses in excess of their margin funds. Placing contingent orders, such as "stop loss" or "stop limit" orders, will not necessarily limit losses to the intended amounts. Market conditions may make it impossible to execute such orders. Customers may be called upon at short notice to deposit additional margin funds. If the required funds are not provided within the prescribed time, their positions may be liquidated. In the event that the market deteriorates rapidly beyond the margin call level and reaches the forced sell level, the bank reserves the right to close out all or part of the outstanding positions without notice and without any margin calls. Customers will remain liable for any resulting deficit in their accounts. Customers may be engaged in leveraged investments in Premium Account and/or other foreign exchange currencies through pledging of deposits (including local and foreign currencies) and/or Premium Account. Minor market fluctuations (including but not limited to fluctuations in currency exchange rate) may multiply customers' losses and lead to substantial deficit. Customers may sustain losses in excess of their collaterals and have resulting deficits in their accounts. Treasury Plus is highly speculative and risky and is subject to the risk of market fluctuation. The value of customers' holdings may be reduced as a result. Customers should have sufficient net worth to be able to assume the risks and bear the potential losses of leveraged investments. Our Bank only offers overnight tenor for Treasury Plus. As the interest rates for Treasury Plus loan may vary during the period of investment, the interest costs may therefore also vary. This may affect the net investment return. Premium Account cannot be terminated before maturity. For customers who pledged Premium Account as collateral, any loan repayment or top up requirement before maturity will have to be covered by other pledged deposit and/or additional funds. If customers do not have sufficient pledged deposit and/or fail to bring in additional funds, the Bank has the discretion to terminate the Premium Account before its maturity date to repay the Treasury Plus loan outstanding. Such early termination may be made at a loss to customers and they will remain liable for any resulting deficit in their accounts. The approved line amount granted is dependent on the quantum of finance allowed for each margin deposits and/or Premium Accounts. The quantum of finance is subject to change by the Bank without notice. If the currency of the loan is different from the currency of the underlying investments and/or deposits, foreign exchange rate risk implications may affect the value of the loan, underlying investments, and/or deposits. Relatively small movements in the exchange rate will have a multiplying effect on customers' corresponding gain or loss and resulting in the possibility of margin call and forced sell. Customers' leveraged position is marked-to-market daily and they may be called upon at short notice to deposit additional funds to avoid a forced sell of their leveraged positions. The margin call level is set at present margin level equal to or exceeds 100%, computed as the ratio of (a) the aggregate of the outstanding amount(including accrued interest) at any time under the revolving credit facilities or otherwise under this account to (b) the aggregate of (i) the value of the eligible deposits (including for this purpose, accrued interest and the value of the investments under Premium Accounts) maintained with the Bank under this account and (ii) the value of the deposits (including accrued interest) to be established or Placements to be made with the Bank from the proceeds of any part of such advances, multiplied by such percentage as may be prescribed by the Bank from time to time (presently, 83.33%) (the "loan-to-security" ratio). If margin call is triggered, customers need to top up the shortfall margin to below 100% within 2 business days. Positions may be liquidated at the discretion of the Bank if a margin call is not complied within the stipulated time period. The margin call level is also subject to change by the Bank without prior notice and the Bank has no obligation to notify customer of the aforesaid event, therefore it is customer's duty to monitor the same. The forced sell level is set at present margin level equal to or exceeds 103.44%, computed the ratio of (a) the aggregate of the outstanding amount(including accrued interest) at any time under the revolving credit facilities or otherwise under this account to (b) the aggregate of (i) the value of the eligible deposits (including for this purpose, accrued interest and the value of the investments under Premium Accounts) maintained with the Bank under this account and (ii) the value of the deposits (including accrued interest) to be established or Placements to be made with the Bank from the proceeds of any part of such advances, multiplied by such percentage as may be prescribed by the Bank from time to time (presently, 83.33%) (the "loan-to-security" ratio). All or any part of customers' margin deposits and/or securities may be realized for settling all or any part of their outstanding without notice. In the event that the market deteriorates rapidly beyond the margin call level and reaches the forced sell level, the bank reserves the right to close out all outstanding positions without notice and without any margin calls. The forced sell level is also subject to change by the Bank without prior notice. Treasury Plus is a revolving loan where interest is accrued daily. All the interest charged and other sum payable will be due and payable at any time forthwith on demand by the Bank. Customers should seek independent advice before making a commitment to apply for Treasury Plus. In the event that customers choose not to seek independent advice, they should carefully consider whether such leveraged investment account is suitable in the light of their own investment objectives, financial position and risk profile. The investment decision is yours but you should not invest in the Treasury Plus unless the intermediary who sells it to you has explained that the product is suitable for you having regard to your financial situation, investment experience and investment objectives. Treasury Plus involves leveraged investment and is subject to a number of risks. Leveraged investments carry a high degree of risk in which a relatively small market movement will have a proportionately larger impact on the funds you have invested or will have to invest. An investor may sustain a total loss of initial margin funds and any additional funds deposited to maintain his/her position. If the market moves against his/her position or margin requirements are increased, an investor may be called upon to pay substantial additional funds at short notice to maintain his/her position. Premium Account is not a bank deposit and involves risks including the possible loss of the principal amount invested. Please refer to relevant brochures for the details and risks involved for Premium Account. Investors should not rely on this document/content of this leaflet alone to make investment decisions. They should also read other relevant documents for details including the risk factors. If you have any enquiries, please seek independent professional advice prior to subscription. Investor's investments are subject to the insolvency and credit risk of Citibank (Hong Kong) Limited (the "Bank"). There is no assurance of protection against a default by the Bank in respect of payment obligation. In case of insolvency of the Bank, you may lose your entire investment irrespective of the performance of the foreign currency market, the terms of the Premium Account and Treasury Plus.